A European team of astronomers using ESO’s Very Large Telescope (VLT) has measured the distance to the most remote galaxy so far. By carefully analysing the very faint glow of the galaxy they have found that they are seeing it when the Universe was only about 600 million years old (a redshift of 8.6). These are the first confirmed observations of a galaxy whose light is clearing the opaque hydrogen fog that filled the cosmos at this early time. The results were presented at an online press conference with the scientists on 19 October 2010, and will appear in the 21 October issue of the journal Nature. Studying these first galaxies is extremely difficult. By the time that their initially brilliant light gets to Earth they appear very faint and small. Furthermore, this dim light falls mostly in the infrared part of the spectrum because its wavelength has been stretched by the expansion of the Universe — an effect known as redshift. 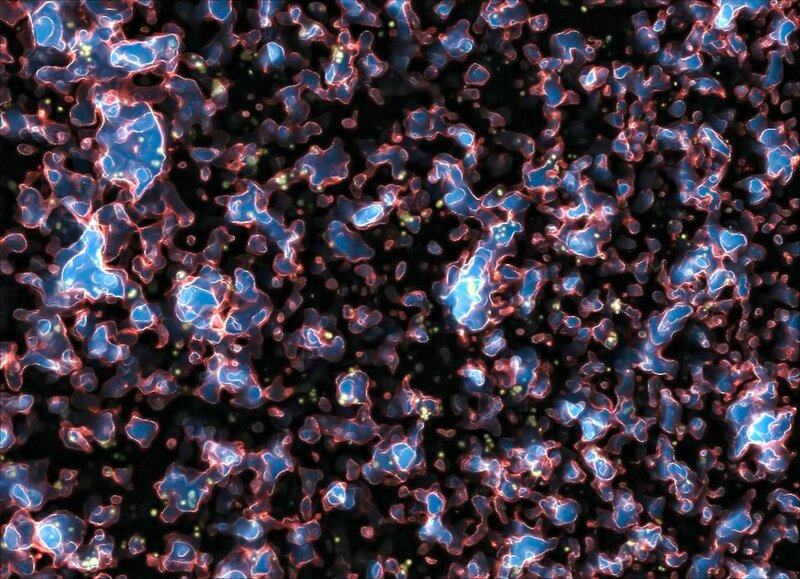 To make matters worse, at this early time, less than a billion years after the Big Bang, the Universe was not fully transparent and much of it was filled with a hydrogen fog that absorbed the fierce ultraviolet light from young galaxies. The period when the fog was still being cleared by this ultraviolet light is known as the era of reionisation . Despite these challenges the new Wide Field Camera 3 on the NASA/ESA Hubble Space Telescope discovered several robust candidate objects in 2009  that were thought to be galaxies shining in the era of reionisation. Confirming the distances to such faint and remote objects is an enormous challenge and can only reliably be done using spectroscopy from very large ground-based telescopes , by measuring the redshift of the galaxy’s light. On special request to ESO’s Director General they obtained telescope time on the VLT and observed a candidate galaxy called UDFy-38135539  for 16 hours. After two months of very careful analysis and testing of their results, the team found that they had clearly detected the very faint glow from hydrogen at a redshift of 8.6, which makes this galaxy the most distant object ever confirmed by spectroscopy. 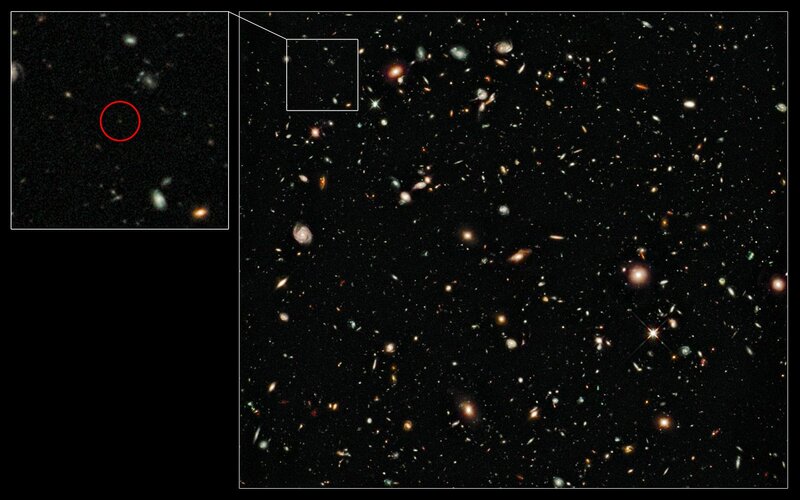 A redshift of 8.6 corresponds to a galaxy seen just 600 million years after the Big Bang. One of the surprising things about this discovery is that the glow from UDFy-38135539 seems not to be strong enough on its own to clear out the hydrogen fog. “There must be other galaxies, probably fainter and less massive nearby companions of UDFy-38135539, which also helped make the space around the galaxy transparent. Without this additional help the light from the galaxy, no matter how brilliant, would have been trapped in the surrounding hydrogen fog and we would not have been able to detect it”, explains co-author Mark Swinbank (Durham University). An earlier ESO result (eso0405) reported an object at a larger distance (a redshift of 10). However, further work failed to find an object of similar brightness at this position, and more recent observations with the NASA/Hubble Space Telescope have been inconclusive. The identification of this object with a galaxy at very high redshift is no longer considered to be valid by most astronomers. When the Universe cooled down after the Big Bang, about 13.7 billion years ago, electrons and protons combined to form hydrogen gas. This cool dark gas was the main constituent of the Universe during the so-called Dark Ages, when there were no luminous objects. This phase eventually ended when the first stars formed and their intense ultraviolet radiation slowly made the hydrogen fog transparent again by splitting the hydrogen atoms back into electrons and protons, a process known as reionisation. This epoch in the Universe’s early history lasted from about 150 million to 800 million years after the Big Bang. Understanding how reionisation happened and how the first galaxies formed and evolved is one of the major challenges of modern cosmology. Astronomers have two main ways of finding and measuring the distances to the earliest galaxies. They can take very deep images through differently coloured filters and measure the brightness of many objects at different wavelengths. They can then compare these with what is expected of galaxies of different types at different times in the Universe’s history. This is the only way currently available to discover these very faint galaxies and is the technique employed by the Hubble team. But this technique is not always reliable. For example, what may seem to be a faint, very distant galaxy can sometimes turn out to be a mundane, cool star in our Milky Way. Once candidate objects are found more reliable estimates of the distance (measured as the redshift) can be obtained by splitting the light from a candidate object up into its component colours and looking for the telltale signs of emission from hydrogen or other elements in the galaxy. This spectroscopic approach is the only means by which astronomers can obtain the most reliable and accurate measurements of distance. The strange name indicates that it was found in the Ultra Deep Field search area and the number gives its precise position on the sky. An online press conference to announce the new results and offer journalists the opportunity for discussion with the scientists will be held at 16:00 CEST on Tuesday, 19 October 2010. To participate in the teleconference, bona-fide members of the media must get accredited by contacting Douglas Pierce-Price by email (dpiercep@eso.org). Reporters will need access to a computer with a recent version of Adobe Flash Player installed and a broadband internet connection. This research was presented in a paper, Spectroscopic confirmation of a galaxy at redshift z=8.6, Lehnert et al., to appear in Nature on 21 October 2010. The team is composed of M. D. Lehnert (Observatoire de Paris – Laboratoire GEPI / CNRS-INSU / Université Paris Diderot, France), N. P. H. Nesvadba (Institut d’Astrophysique Spatiale / CNRS-INSU / Université Paris-Sud, France), J.-G.Cuby (Laboratoire d’Astrophysique de Marseille / CNRS-INSU / Université de Provence, France), A. M. Swinbank (Durham University, UK), S. Morris (Durham University, UK), B. Clément (Laboratoire d’Astrophysique de Marseille / CNRS-INSU / Université de Provence, France), C. J. Evans (UK Astronomy Technology Centre, Edinburgh, UK), M. N. Bremer (University of Bristol, UK) and S. Basa (Laboratoire d’Astrophysique de Marseille / CNRS-INSU / Université de Provence, France).